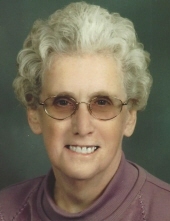 Eileen A. Tharp, 88, of Kingston Mines passed away Wednesday, March 27, 2019 in Glasford. She was born October 6, 1930 in Peoria to Merrel and Rickie Neptune Kern. She married John Elwood Tharp; he preceded her in death August 24, 1992. Her parents; daughter, Stephanie; sons, Justin, Matthew, Mark; brother, Jim Kern and sister, Betsy Patterson preceded her in death. She is survived by her daughter, Reilly (Mike) Reynolds; son, John L. (Debbie) Tharp; son-in-law, Dwayne Gilfour; grandchildren, Mike (Angie) Reynolds, Stacy (Bob) Dodson, Sarah (Patrick) Jaszarowski, Andrea (Marquise) Henderson; nine great-grandchildren and brothers, Rudolph “R.J.” Kern and Wayne (Donna) Kern. Eileen was well known for her chicken & noodles and red cake. She was a 70 year participating member of Kingston Mines United Methodist Church; her favorite Hymn was Others. She was also an Election Judge for 23 years, 27 year Board Member on the Glasford Telephone Company, 16 year Board Member of the Kingston Mines Town Board, Den Mother for the Cub Scouts for many years and wrote articles for the Glasford Gazette. Eileen was a very giving woman and will be greatly missed by her family and friends. Cremation has been accorded and a memorial service will be held on Saturday, May 4, 2019 at 11:30 am with visitation one hour prior at the Kingston Mines United Methodist Church. Burial will follow the services at the Kingston Mines Cemetery. Memorials may be made to St. Jude Children’s Hospital in her name. To send flowers or a remembrance gift to the family of Eileen Tharp, please visit our Tribute Store. "Email Address" would like to share the life celebration of Eileen Tharp. Click on the "link" to go to share a favorite memory or leave a condolence message for the family.